For the rest of the month we have some haunting folklore from far-flung corners of the world, but we’ll start with my home town, New Jersey. On a dark and stormy night, a witch called Mother Leeds gave birth to the son of the devil. The night of the baby’s birth was stormy, but the birth was free of complication and the newborn baby was beautiful and healthy. At least at first. Within minutes, the baby started to change. Before the eyes of all present, the baby grew at an impossible rate. It sprouted horns from it’s head and claws from it’s hands and feet. Leathery bat wings unfolded and spread open on its back, and it’s eyes burned with a hellish fire. The vile creature killed its own mother, then the midwife. Then it attacked it’s father. The man fought back, and the baby, perhaps weary and not interested in a struggle, leapt into the fireplace and disappeared in a cloud of ash. It’s haunted howls could be heard for hours and long over the years. There is a another version of the story less varnished by time and terrified tellings around campfires, a version supported by some historical evidence. That version, even though it is more down to earth, is no less interesting. In the 1620s Quakers settled in what would become southern New Jersey. In 1702, England appointed the first royal governor to the area, Lord Cornbury, Edward Hyde. Lord Cornbury’s primary mission was to protect the colonies during the War of Spanish Succession, or the 2nd French and Indian War, or, as it was called in America, Queen Anne’s War. He successfully prevented French incursion, yet managed to become one of the most hated governors of colonial America. Scandal surrounded him, including accusations that he often wore women’s clothes in public. 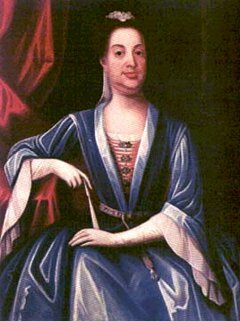 In fact, it was said that he dressed up and pretended to be his cousin, Queen Anne. One of Lord Cornbury’s councilors was a man named Daniel Leeds, from Leeds, England. He was a devout Quaker who claimed that as young man he had ecstatic visions. In the 1690s Leeds acquired land which came to be known as Leeds Point. This is the place most associated with the legend. 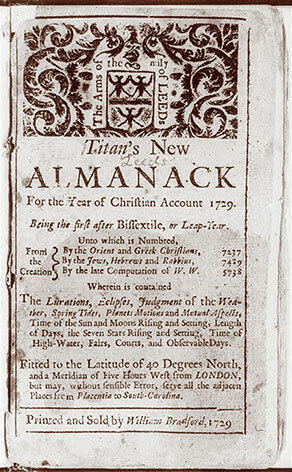 Daniel Leeds began publishing an almanac in 1687, which included astrological data that did not please his Quaker readers. Some complained that Leeds had used inappropriate language and astrological symbols and names that were a little too “pagan.” Despite a public apology, all copies of the almanac not in circulation were taken and destroyed. Leeds was so angered by this censorship that he broke with the Quaker community, saying they denied the divinity of Christ and spoke out against England. He continued publishing the Almanac, adding progressively more esoteric and occult material, including subjects like cosmology, demonology and natural magic. The Quakers eventually accused him of being “Satan’s harbinger.”. In 1716, Daniel’s son Titan Leeds began himself publishing the almanac, and perhaps in keeping with his father’s open hostility with the Quakers, he included the family crest, which he redesigned to include three wyverns, a dragon-like creature which stands on clawed feet, a creature reminiscent of reports of the Jersey Devil. If that wasn’t enough. 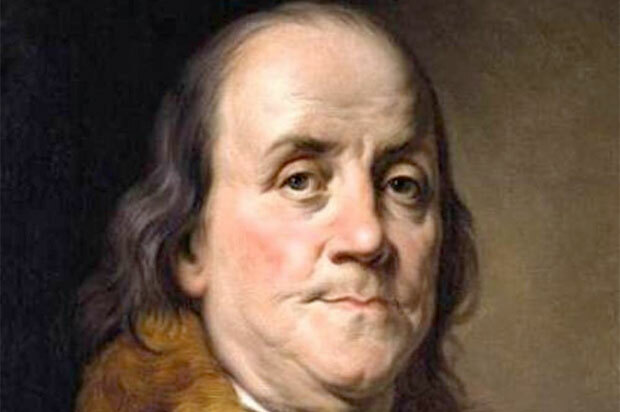 Benjamin Franklin accused Titan of being a ghost resurrected from the grave. Almanacs were a lucrative market in the 1700s, apparently, and a young, not yet massively legendary upstart named Benjamin Franklin decided to enter that market in 1732 with Poor Richard’s Almanac. Totally in keeping with Franklin’s wit and humor, in 1737 Franklin mocked Leeds’ astrology content by satirically using astrology to predict Titan Leeds’s death in October of that same year. This only spurred Franklin on. He continued to mock Leeds, proclaiming that the man had indeed died as he predicted and was now tormenting Franklin as a ghost risen from the grave. Franklin continued to refer to Titan Leeds as a “ghost” even after Leeds’s actual death in 1738. After Leeds’ death in 1738, Franklin wrote, “Honest Titan, deceased, was raised [from the dead] and made to abuse his old friend [Franklin],” and he continued to write of Titan’s ghost haranguing his enemies. Which brings us to the birth of a devil to unfortunate Mother Leeds. After her grotesque offspring vanished up the chimney and into the night, residents of the Pine Barrens claimed they saw the Leeds Devil infrequently but persistently over the centuries. Here are some of the more notable sightings. Joseph Bonaparte, elder brother of Napoleon, claimed to have witnessed the Devil while hunting on his Bordentown estate some time in the early 1800s. In 1840 the Leeds Devil was blamed for several livestock killings. Similar attacks were reported during 1841, accompanied by tracks and screams. In 1856, the Atlantic Monthly published an article chronicling folk tales of the Leeds Devil popular among Pine Barren residents. Then, starting in mid January, 1909, newspapers published hundreds of claimed encounters with the Jersey Devil from all over the state. It started when frightened witnesses reported strange tracks resembling hoof-prints in the snow. Many reports claimed the mysterious tracks traveled over and under fences and across rooftops and all across New Jersey and Pennsylvania, even in large cities like Camden and Philadelphia. Bloodhounds wouldn’t follow the tracks. Schools closed in southern Jersey. Mill workers refused to travel through the woods to their jobs. 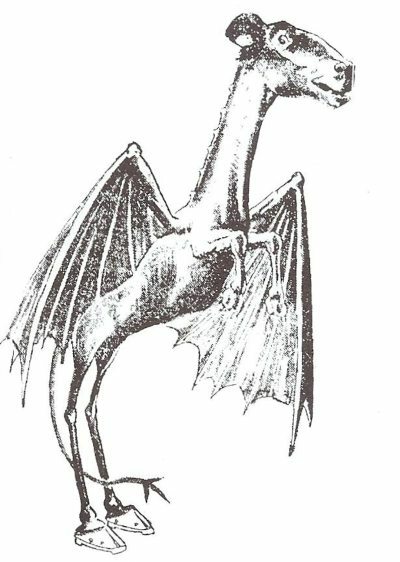 Newspapers invented names for the creature like “wozzle bug,” “flying hoof,” and “winged dog,” but, the creature quickly came to be known as the New Jersey Devil. The Devil attacked a trolley car in Haddon Heights and a social club in Camden. There were dozens of witnesses in both cases. Police in Camden and Bristol, Pennsylvania supposedly fired on the creature with no effect. A man named Thack Cozzens may have been the first to see the devil that week as he stepped out of the Woodbury Hotel. From there, the creature went on a zigzagging course that took him up and down the Delaware Valley. He spooked a patrolman in Bristol, Pa., left a maze of footprints in Burlington City, and killed a puppy in Riverside. The Jersey Devil came to Trenton came on Jan. 20, shortly after midnight. William Cromley, a doorkeeper at the Trent Theater, was driving his buggy back to Ewing when the horse stopped dead in its tracks. Cromley got out, puzzled, and saw a beast in the form of a dog with fur and feathers. It hissed, spread its wings and flew away. At about the same time, something woke up Claudius P. Weeden by banging on his door at 217 Brunswick Ave. He flung open his bedroom window, heard wings flapping, and looked outside to see strange tracks imprinted in the snow, cloven hoof-prints. Sightings of creatures resembling the Jersey Devil were reported as far away as Delaware and Western Maryland. The widespread newspaper coverage created such a panic in the Delaware Valley that schools closed and workers to stayed home. Groups of hunters searched areas where the Devil had been sighted. Even the Philadelphia Zoo supposedly posted a $10,000 reward for the creature. At this time, Philadelphia’s Arch Street Museum was in danger of closure. The museum’s proprietor, T. F. Hopkins, appealed to Norman Jeffries, the museum’s publicist to come up with something to boost attendance. Jeffries, a renowned hoaxer, was well aware of the stories about the Jersey Devil. So when the museum the publicist saw that the Philadelphia zoo was offering a reward he decided that a captive Jersey Devil would be the ideal crowd-puller. Jeffries planted fake tracks and manufactured a few sightings and had them published in local newspapers to build the hysteria further. Then he bought a kangaroo from a circus and used glue to attach claws and fake bat wings. The museum declared to the public they had captured the Devil. All told, nearly 1000 reports were made What prompted the 1909 flap? Had the Devil awoken from a long slumber? Some say the first animal tracks were a hoax, but it is possible this has been confused with Norman Jeffries’s hoax. If the stories of the tracks are to believed. It’s impossible for anything less than a small army with special equipment to have produced the animal tracks. Even more strange. The phenomenon of these tracks bear an eerie resemblance to another instance in Devon England several decades later. 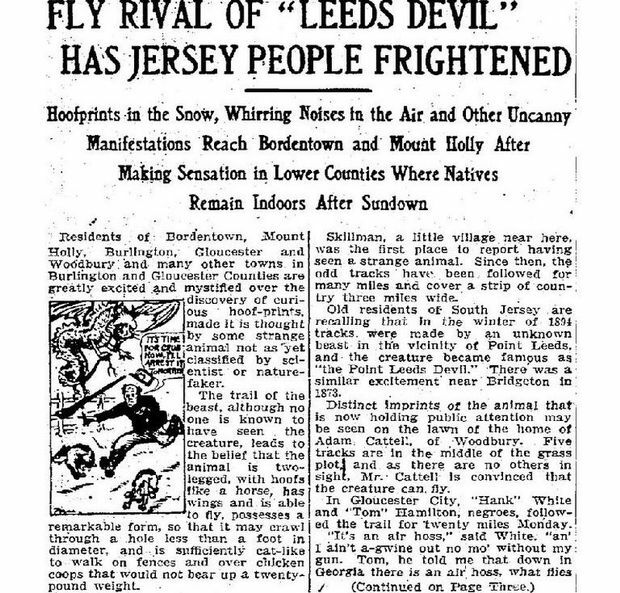 There hasn’t been another hysteria like 1909, but reports of the New Jersey Devil persist to this day. In 1927, a taxi driver in Salem City said he saw the Jersey devil while he was changing a tire. He told police he saw a winged creature stomping on the roof oh his taxi. In 1960, of the course of many days, residents of Mays Landing called police saying they heard horrific screams at night. A circus owner even offered a $100,000 reward. In 1972, a woman reported seeing the Jersey Devil while driving between Blackwood and Glassboro. She said it was taller than a man with the lower half of a goat. In 1980, Wharton State Forest Ranger, Chief Alan MacFarlane, a mutilated pack of pigs. The backs of their heads were apparently eaten, and their bodies were scratched and torn. He found no tracks other than the pigs and no blood. In 1993, another Forest Ranger, John Irwin was driving through woods near the Mullica river when he saw something blocking the road ahead of him. He said it was a six-foot-tall creature with horns and matted fur. It stared at him for several minutes before running into the forest. More recently, three cars in Bayville all slammed on their brakes when a ten-foot-tall figure with a long head and short flat ears galloped out of a wooded area and crossed their paths on route 9. It’s weird to consider how many people have seen the New Jersey Devil over the years when you know the mundane if interesting history of it. Is it hysteria? Is there a mutant population of sand hill cranes terrorizing the country? And how long will the age of smart phones and constantly-improving smartphones go on without decent pictures of at least one chupacabra?